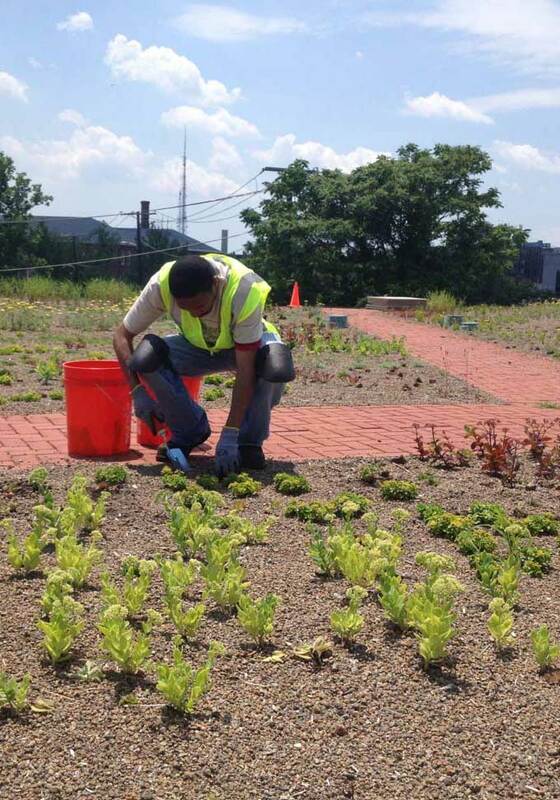 The Politics of Green Infrastructure in D.C. 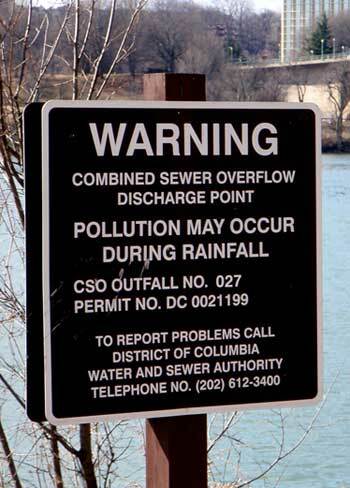 While the Potomac and the Anacostia Rivers gave birth to the District of Columbia, they have suffered years of contamination from raw sewage, which spill into the rivers when the aging combined sewer and stormwater infrastructure overflows. To address this issue, in 2010 the District initiated the DC Clean Rivers Project (DCCR) and began constructing massive underground tunnels that will convey contaminated runoff into the Blue Plains wastewater treatment facility. While a deep-bore tunneling machine affectionately named Lady Bird digs its way 100 feet each day at great expense, D.C. is now finally able to move forward with a more cost-effective green infrastructure plan, like New York City and Philadelphia. A new agreement with the Environment Protection Agency (EPA) and Department of Justice (DOJ) finalized in May allows DC Water, the city’s water utility, to remove one of the proposed tunnels and instead invest in turning hundreds of acres of impervious surfaces into green, absorbent ones. However, it appears not everyone will benefit equally from the new green infrastructure plan. Under the new consent decree with the EPA and DOJ, DC Water eliminated the previously-planned underground tunnel for Rock Creek and will instead build green infrastructure that covers 365 acres. Phases of this work will start soon and the whole plan will be complete by 2030. The neighborhoods of Columbia Heights, Takoma, Petworth, and others surrounding the Rock Creek watershed will get rain gardens, bioswales, porous pavement, and green roofs designed to capture and clean runoff, replacing the originally-planned tunnel. 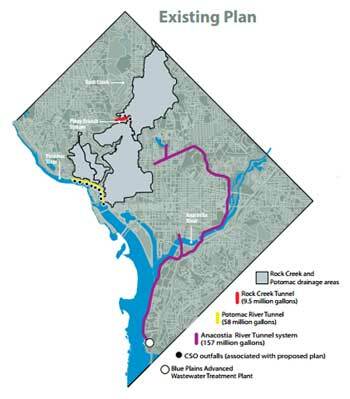 Near Georgetown, there will still be a tunnel but gravity, rather than an energy-intensive pumping station, will passively transfer water to the wastewater treatment plant, explains CityLab. That stretch will also get some new green infrastructure. However, as some local activists who attended a recent briefing at the National Building Museum made clear, there are deep concerns about whether the new green infrastructure approach will benefit the Anacostia River communities any time soon. Over the years, the Anacostia, which is considered one of the most polluted waterways in the nation, has borne the bulk of environmental abuse. This is why DC Water made creating a new tunnel to address the Anaocostia River’s problems the highest priority. However, the community won’t see the benefits until at least 2022 when the new tunnel finally opens. Then, it’s expected to remove about 98 percent of the river’s pollution, making it potentially clean enough to swim in. Meanwhile, along the Anacostia’s 8 miles, combined sewer overflows continue to occur in 17 different places, reports CityLab. So, according to these activists, the new plan has raised some environmental justice issues: it’s about who reaps the many benefits of green infrastructure first, and who gains the most long-term. This desire for green infrastructure isn’t simply about cleaner rivers. Green infrastructure creates additional green space for the neighborhoods, reduces the heat-island effect, and improves air quality while creating jobs and increasing property values. The discrepancy in property values and income levels between the neighborhoods that will receive these benefits sooner and those that will receive a mostly-grey infrastructure fix is clear. Despite the fears that green infrastructure can lead to gentrification, many argue that access to green infrastructure empowers communities and further marginalizes those without it. Even with the slow progress of the Anacostia tunnel, green infrastructure projects should be started sooner along the Anacostia. There are so many opportunities. For example, along Buzzard’s Point in Southwest D.C., there are opportunities to create a new waterfront promenade that can also capture runoff with natural systems. Vacant houses in the area could also be turned into stormwater cisterns or redeveloped as parks. But, as of now, the only real plans are to create a new D.C. United soccer stadium there, which will only increase impervious surfaces, unless green infrastructure is better integrated into the design. With new incentives, green streets and roofs could spread throughout these neighborhoods, too. The new 11th Street Bridge Park will help restore the Anacostia River ecosystems, but this project is still many years away. The new South Capitol street corridor project will bring some green infrastructure to the Anacostia area as well, but perhaps not enough. 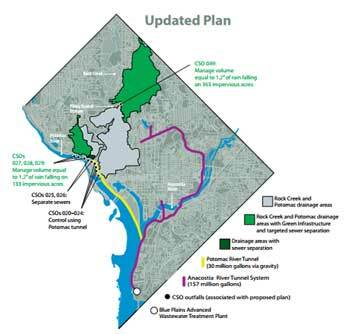 DC Water, which has been pushing for its new green infrastructure approach for years, has limited resources to fulfill its mission, and the tunnel and green infrastructure plan are great expenses. It certainly wants to bring more green infrastructure to the District, but, hopefully, these green infrastructure opportunities can be widespread so everyone benefits equally. The tunnel + green infrastructure plan seems like a good solution in addition to providing added value in terms of environmental service (public space, flood prevention, air quality…) Isn’t more profitable in the long run, to stop and transform sources of pollution?. The new plan could be a complementary stage of a bigger one.